The Gerald A. Bartell Community Theatre Foundation is a unique collaboration between six theatre companies. Within our walls, Madison artists tell stories about themselves and their world. Audience members are transformed, enlightened, entertained, and invited into the conversation about who and what this community is. The Foundation is governed by a board of directors selected in an co-op style arrangement practically unique in the United States. The Foundation supports Madison Ballet, Madison Theatre Guild, Mercury Players Theatre, StageQ, Strollers Theatre, and Kathie Rasmussen Women’s Theatre (Krass). The purpose of the Gerald A Bartell Community Theatre Foundation, Inc (GABCTF) is to equip, operate, and maintain a live-performance facility created by the Foundation for the benefit of the Participating Theatre Companies (PTCs), and additional publicly supported organizations of the same class, so as to assist them in carrying out the purpose for which they are organized. 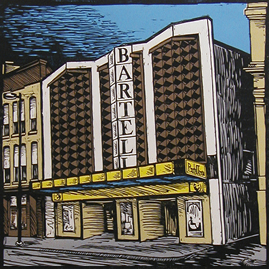 The Bartell Theatre Foundation started as a brick shell with three wooden floors, built in 1906, called the Colonial Hall. It was first a home of the Kehl Dance Academy on the third floor, the large Colonial Hall on the second, and a bowling alley on the first. In between then and 1966 there was Joseph Falci’s Shoe Repair Shop, Dugan & Pratt Restaurant, Frederick Hess Shoe and Bicycle Repair, Sharon’s Bar, Colonial Hall renamed Uptown Hall, P&G Cafe and Tavern, and for a long time it was the VFW Post 1318. The Veterans of Foreign Wars Post 1318 owned and enjoyed the building for more than 20 years with few changes. In 1966 it was sold to a group of real estate developers that included Gerald A. Bartell (total coincidence!). For the next three years the first floor of the building housed Mr. McDonald’s Barber Shop and the Herlitz Tap Tavern before it was extensively renovated to create the Esquire Movie Theater. The Esquire was owned and operated by Marcus Theaters, Inc. until about 1991. When it first opened, the Esquire was popular and profitable, but attendance dropped, and in the 80”s the Esquire was modified to make the balcony a separate theater with a second projection room built for the lower floor. In the Spring of 1994 a small group of Tom Haig, Karen Tusack, Leo and Lee Ann Cooper, representing Madison Theatre Guild, Strollers Theatre, Reprise Theatre, and Mazo R&R, found out about the Esquire, decided they wanted it and set about making it happen.